GAF roofing contractor Northern Virginia is Fairfax contractor. As a roofing contractor in Northern Virginia GAF is are our go too brand of shinges to replace rour homes roof in Northern Virginia. GAF is the largest manufacturer of roofing shingles in the United States. 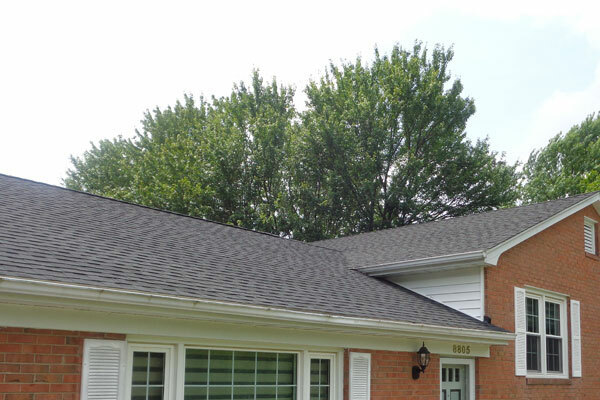 GAF roof shingles are fiberglass asphalt constructed shingles. GAF offers a wide range of colors for their various roofing products. GAF Timberline® lifetime architectural roofing shingles are one of the best choices for your new roof replacement. If you are looking to replace your existing Northern Virginias homes roof because of age, wind damage, or hail look to GAF. 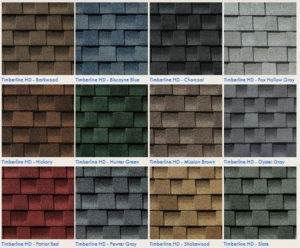 GAF offers a large verity of roofing shingle styles, and colors, to match your home and budget. When you choice Fairfax contractor to install any GAF Lifetime Shingle we will use at least 3 qualifying GAF accessories. Then you will automatically get a Lifetime warranty on your roofing shingles.Your Northern Virginia roof represents close to 40% of your home’s curb appeal. We you can increase your home’s resale value with Timberline High Definition Shingles (HD) from GAF Timberline HD Shingles will not only MAKE your roof stand out but also protect your homes re-sale value. This chart shows the colors of GAF Timberline HD roofing shingles. Timberline GAF offers a wide range of roofing colors to match your Northern Virginia home. GAF 3-tab roofing Architectural shingles are one of the most popular roofing shingles Fairfax Contractor offers. GAF Timberline® lifetime architectural roofing shingles are the top of the line roofing shingle. Fairfax Contractor has replaced many roofs in Northern Virginia using GAF roofing products. As a roofing company, we always look to GAF roofing products because of their durability and fantastic warranties. Pictured here is GAF Timberline® HD lifetime architectural roofing shingles color chart. For more information about replacing your roof in Northern Virginia with GAF roofing products click this link. You as a Northern Virginia home owner can get an extended warranty by using 3 qualifying GAF Accessories.Install Any GAF Lifetime Shingle and at least 3 qualifying GAF accessories and you will automatically get the Golden Pledge® Ltd. Warranty. One qualifying GAF product is WeatherWatch® Mineral-Surfaced Leak Barrier. WeatherWatch® is one of the great products GAF offers to make sure your roof will last a lifetime. Another accessory is GAF Deck Armor provides a essential extra layer of protection between your shingles and your roof deck. If you are on a budjet you may want to conciter Royal GAF 3-tab fiberglass roofing singles. GAF Royal 3-tab roofing shingles provide a great choice for replacing your Northern Virginia roof. Fairfax Contractor installs GAF roofing in the Northern Virginia Counties including Arlington County, Fairfax County, Loudoun County, and Prince William County VA. We also replace roofs in the following Fairfax County cities including Alexandria, Annandale, Burke, Clifton, Centreville, Chantilly, Fairfax, Fairfax City, Fairfax Station, Falls Church, Great Falls, Herndon, Kingstown, Langley, Lake Barcroft, Lorton, McLean, Newington, North Springfield, Oakton, Oak Hill, Reston, Springfield, Sterling, Tyson’s Corner, and the Vienna, Virginia. Fairfax Contractor also is licensed to do work in Arlington County, including the cities of Arlington Forest, Ballston Crossings, Cherrydale, Claremont, Rivercrest, Westover, and Yorktown, Virginia. In Loudoun County we install all types of GAF produts in the cities of Ashburn, Aldie, Bristow, Dulles, Countryside, Lansdowne, Leesburg, Purcellville, Potomac Falls, South Riding, and Stone Ridge Virginia. And finally we work in the cities of, Prince William County, including Dumfries, Dale City, Gainesville, Haymarket, Lake Manassas, Lake Ridge, Manassas, Manassas Park, Occoquan, Triangle, York Shire, and Woodbridge Virginia.